Lipstick Is A Life: Face of the HoliDAY: All Dolled Up! Face of the HoliDAY: All Dolled Up! for today's Face of the HoliDAY, perfect for a party with lots of pictures being taken. Simple, classic, glamour. Smashbox Photo Finsh More Than Primer Blemish Control all over the face. Bobbi Brown BBU Palette I used this MUA palette to do cream contouring and to conceal my under eyes. This palette is great of makeup artists, but you don't need all of the Skin Foundation Stick shades or all the Correctors or Concealers, but they are great individually or just 3 shades (of foundation for contouring. Make Up Forever HD Invisible Cover Foundation in Ivory 115 and Sand 125 to blend out the cream contour. NYX Blusher in Taupe to contour (this is an amazing shade for fair skin). Too Faced Chocolate Soleil Bronzer to lightly mix with my contour. Charlotte Tilbury Mini Lipstick Charms I used the shade So Marilyn from the trio. NARS Blush in Sin, used near the contour and on the upper cheek bones. 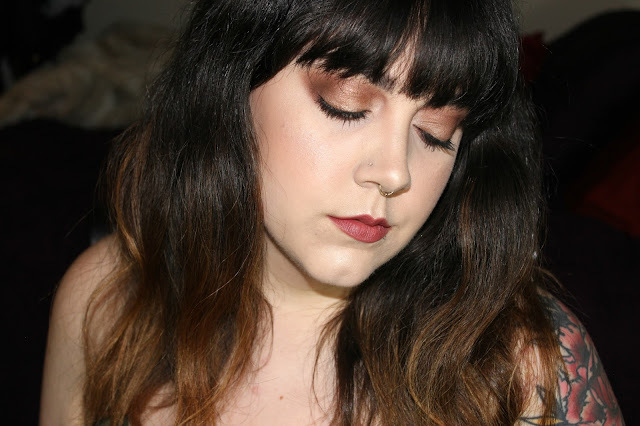 Too Faced Candlelight Glow Highlighting Duo Powder on the highpoint of my face. Bobbi Brown Long-Wear Gel Liner in Black Ink to create a cat-eye. this look and that it gave you some ideas for your holiday. If you missed my last Face of the HoliDAY look click here. Have a cheerful week!